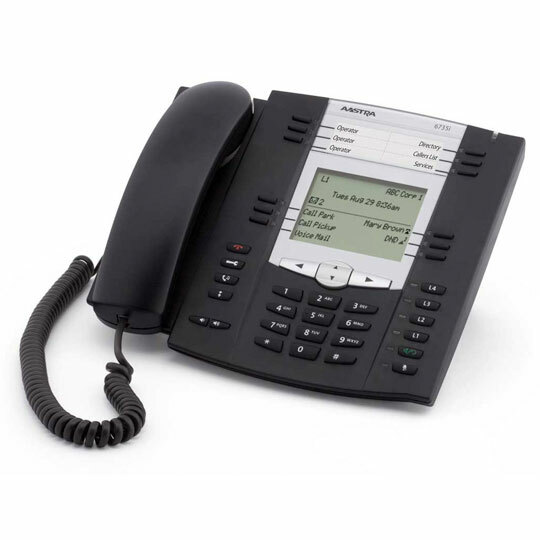 The 6735i SIP Phone brings HD Audio and GigE to Mitel’s popular mid-market phone offering. Providing dual Gigabit Ethernet ports via an integrated Gigabit Ethernet switch, the 6735i is built for today’s high bandwidth network environments. The 6735i combines the exceptional voice quality of HD audio with powerful features and flexibility in a standards based, carrier-grade advanced level expandable IP telephone. With a sleek and elegant design, 144 x 75 pixel backlit LCD display and 6 dynamic context-sensitive softkeys, the 6735i is fully interoperable with leading IP Telephony platforms, offering advanced XML capability to access custom applications and support for up to 9 calls simultaneously. The 6735i is ideally suited for moderate to heavy telephone users who require several one touch feature keys and XML based programs, in a Gigbit network environment.